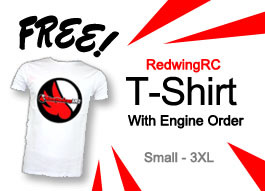 RedwingRC Engines: DA, DLE Engines. These are the BEST engines around and pair perfectly with RedwingRC Airplanes. Choose from DA and DLE Engines. DA mufflers feature all aluminium CNC construction and a large baffled main canister. These design features make them a very durable in-cowl muffler. Included with DA mufflers are two pressure fittings for smoke and two plugs for the inlets if you do not run smoke. Enjoy your DA mufflers Today! These mufflers are made for DA Engines. Click Here! Backed by the best service and support in the industry. Gas/Oil Mix: Break in with Lawn Boy(or similar non synthetic oil) at 32:1 Ratio per gallon / Use RedLine oil at 50:1 for long term use after break in. The new benchmark for 40% aerobatic planes ! With the experience of the extremely reliable DA-150 in our mind, we created the all-new DA-170. Even lighter, even stronger and the same reliability as the 150: The new champion for your 40% airplane. The Champion of Champions ! After its first presentation at the 2002 TOC, the DA-200 started its career winning every Shootout competition - and much more. Now it is available to do its amazing job also in your 40-50% airplane. Enjoy the extremely low vibration and the best mid-range transition you can think of. The DA-200, our new masterpiece! Desert Aircraft is backed by the best service and support in the industry. Gas/Oil Mix: Break in with Lawn Boy(or similar non synthetic oil) at 32:1 Ratio per gallon / Use RedLine oil at 40:1 for long term use after break in. First introduced in March 2003, the DA-50R sets the standard in 50cc powerplants. It's perfect for any 25-30% aerobatic aircraft. Available with 3 different length standoffs: 1.25", 2.5", 3"
INCLUDES: Engine, spark plug, ignition, instruction manual, and post style standoffs. The DA60 is the latest high performance offering from Desert Aircraft for planes in the 50cc to 70cc class. Typical props sizes are 24x8 and 24x10. At only 3.1 lbs, the power to weight ratio is excellent. The DA reed valve and Walbro carburetor are well matched, providing consistent engine performance at all flight attitudes and throttle settings. Throttle and choke arms are pre-installed. Exclusive DA designed cylinders, pistons, and crankshaft. Backed by the best service and support in the industry. Designed for 18-24 lb aerobatic aircraft. Ultimate Power in its class ! The all-new DA-85 combines the low weight and the affordable price of an single-cylinder-engine with the power usually only 100cc engines have. The perfect choice for your 35% sized airplane. + Free Shipping (Continental US only!) If international customer, please contact us for shipping quote. You will be charged separately for shipping. Giant-scale enthusiasts will love the power, performance and value of the DLE-120cc. This thing is a MONSTER! The DLE 120 delivers 50 pounds of static thrust - MORE than enough power for the most intense 3d maneuvers. Plus the twin cylinders are always a plus - reducing the vibration and engine wear and tear AND increasing overall performance. The DLE 120 deivers the most punch and power at the lowest weight and price of any other engine in its class - who can say no to that?! Glow power isn't the only option anymore. The DLE-20 not only fills the displacement gap, but includes a beam mount to make the glow-to-gas upgrade drop-in fast and easy. A rear pumper carb simplifies installation and adjustment of the DLE 20cc. A generous package of "extras" and electronic ignition for starting ease and top performance make the DLE 20 an attractive alternative to glow…and a solid buy for value and performance. We supply a free 2 year warranty with our DLE 20, and also back it with our in house repair of DLE engines.